TMNT Adventures classic trades have 2 more books left possibly. Moon Eyes Saga, then the young TMNT stories paired up with the Year of the Turtle mini, maybe? That's going to be a nice section of the bookshelf when it finishes. One thing I'm wondering is why these issues are coming out so much earlier than normal. 81 comes out in just a week, and Universe 21 is coming when 81 normally would. Which is no problem for me, it's pretty neat to get something so early. 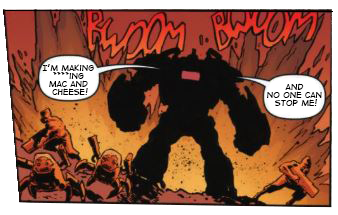 The lineup in the art of the Oncoming Doom issues is pretty interesting to me, mostly because of how it sets up the Triceratons as being in the more aggressive role, with Donatello having to act as protector to the Utroms...when I have the feeling that is not going to be the case in the slightest, no sir-ee. It also makes me think of an "in media res" moment, where the action would freeze on 21's cover, and goes onward to Donatello narrating "You're probably wondering how I got in this situation". I suspect the Triceratons will be resolved once and for all in this 2-parter. There doesn't seem to be much place for them on Earth and it would just cause trouble with Bishop and the NYC population again. The Utroms will probably find them a new home in Dimension X.
I do wonder how long the Utroms themselves will stay on Earth. With Krang gone they have no reason to stay here either, and I wonder if they'll also discover a new planet to call their own. The Earth is the home that Krang intended for them to have - he just didn't get as far as he wanted to. And I for one am doubting that Ch'rell, Kleve, and Montuoro would want to leave after all the energy Krang poured into ensuring that the island at the very least could be their new home. Which is why Attack on the Technodrome 2: This Again will probably be a 1xx storyline. It'll be called Attack of Technodrome this time. Why? Bane was introduced in a side special, not even with Batman in the title. Doomsday in a spinoff Superman series. But, at least the secondary cover for 22 makes a lot more sense. Especially with the seed not sprouting yet.